It is an auction based CPM model where I get to name my own price and adjust accordingly; of course my ads may not run at the price I choose, but that's ok.
You only pay when the ad runs and according to the meeting, DVR playbacks are not included in the cost. You get some great reporting from the TV buy including where and when the ads ran, impressions, paid CPM, # impressions that watched the entire ad, and total/avg seconds viewed. I walked away from that meeting very excited. This puts the power of TV, albeit on Dish Network only, into the hands of small advertisers. And, if you don't have any commercials, Google will give you a $2K credit to spend on building the ads if you agree to spend $2K per week for 4 weeks on Google TV. If you have the money and don't get the attention you need from your media agency, you should give this a shot yourself. 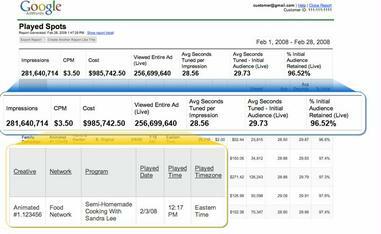 It is also great for testing content and ads on different shows before you go big nationally. The only problems I can find with Google TV are that there is limited geo-targeting available today and it is just available on Dish. The geo-targeting is more problematic since it excludes local markets, but there might be a way to get around it by choosing a specific network (New England Sports Network), but that is a poor method for approximating geo-targeting. Other than that, I'm so pumped on Google TV that I might run my own ads! BTW - I know I'm about a month behind on this, but I didn't think it was a big deal because of the problems we ran into with Google Audio. After the meeting last week, I'm a believer. This sounds/looks pretty damned nifty!